Growing Readers: The books your child is reading! Hello and welcome to room A-14! Personal life: I was born in Philadelphia but have lived in New Jersey since I was five years old. I am a huge Philadelphia sports fan and I love watching the Eagles every Sunday and the Flyers in the winter! I attended elementary school in the North Hanover School District and then attended high school at Notre Dame HS in Lawrenceville. I am the middle child and have two siblings. My parents recently got a yellow puppy lab named Ruby, who we adore. I come from an Italian family so family is the core of my roots. I am always a supporter of parent involvement and having the family support our young learners. Career life: This will be my fourth year as a teacher at PECEC. I obtained my Bachelors degree in Early Childhood from West Chester University of PA in 2013. After college, I moved back to NJ to become a NJ certified edcucator. 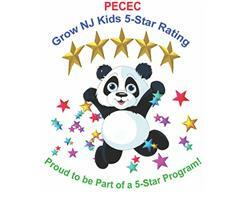 I obtained my certfication in NJ for Preschool - 3rd grade. I have gained ample experiences through my Bachelor's and Master's programs. I am currently working on my Special Education Certification from Rowan University. Professional goal: My goal for this school year is to increase parent involvment! Studies have shown that a chid who has home and school support go on to become confident and happy learners. Let's work together to support our youth.